Diogenes was a famous Philosopher from Greece, who lived between 412 BC and 323 BC. 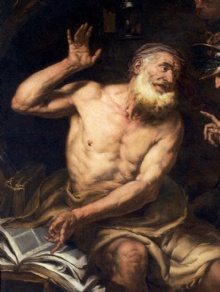 Diogenes of Sinope was a Greek philosopher who is known for his self-denial. He is considered by the cynics. He believed that one should do anything to satisfy their needs in the cheapest and easiest way. He lived in a barrel and owned only a very few things. It is said that Alexander the Great once met him at Corinth. Alexander gave him a wish. Diogenes wished only that the king should move so that the sun could shine on him. Our collection contains 28 quotes who is written / told by Diogenes, under the main topic Patriotism. "The great thieves lead away the little thief"
"The foundation of every state is the education of its youth"
"Stand a little less between me and the sun"
"Most men are within a finger's breadth of being mad"
"Man is the most intelligent of the animals - and the most silly"
"It was a favorite expression of Theophrastus that time was the most valuable thing that a man could spend"
"It takes a wise man to discover a wise man"
"It is the privilege of the gods to want nothing, and of godlike men to want little"
"I threw my cup away when I saw a child drinking from his hands at the trough"
"I know nothing, except the fact of my ignorance"
"I have nothing to ask but that you would remove to the other side, that you may not, by intercepting the sunshine, take from me what you cannot give"
"I do not know whether there are gods, but there ought to be"
"I am called a dog because I fawn on those who give me anything, I yelp at those who refuse, and I set my teeth in rascals"
"He has the most who is most content with the least"
"Dogs and philosophers do the greatest good and get the fewest rewards"
"Blushing is the color of virtue"
"As a matter of self-preservation, a man needs good friends or ardent enemies, for the former instruct him and the latter take him to task"
"A friend is one soul abiding in two bodies"
"Wise kings generally have wise counselors; and he must be a wise man himself who is capable of distinguishing one"
"When I look upon seamen, men of science and philosophers, man is the wisest of all beings; when I look upon priests and prophets nothing is as contemptible as man"
"What I like to drink most is wine that belongs to others"
"We have two ears and one tongue so that we would listen more and talk less"
"Those who have virtue always in their mouths, and neglect it in practice, are like a harp, which emits a sound pleasing to others, while itself is insensible of the music"
"The vine bears three kinds of grapes: the first of pleasure, the second of intoxication, the third of disgust"
"The sun, too, shines into cesspools and is not polluted"
"The sun too penetrates into privies, but is not polluted by them"
"The mob is the mother of tyrants"